Kara Caine Lawson has worked hard to become the woman she is-wife, mother and successful shop owner. Having survived a turbulent childhood, Kara understands that life could’ve just as easily gone another way . . . and even if she isn’t gliding through the trials of lost library books, entitled customers and routine date nights, at least she’s not sipping a Dewar’s all day like her mother did. But then Kara unexpectedly encounters paintings by her now-famous college boyfriend just as she’s beginning to suspect that her daughter Henny’s difficulties may be the sign of something serious, and all of her past decisions are thrown into dramatic relief. As a look at modern motherhood, and the myriad of directions women find themselves pulled in, Henny on the Couch worked beautifully. Kara is completely subsumed by her family’s needs and the business she fell into that she has lost sight of who she actually is. This desire to reclaim herself comes in the guise of fantasies about the love affair that defined her young, pre-marriage life. 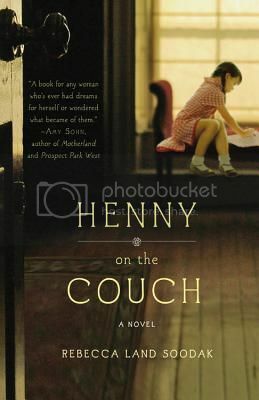 At the same time, Soodak tries to do a few too many things in Henny on the Couch, the thread of Kara’s mother’s alcoholism in particular adds little to the story, while serving to make the whole thing slightly disconnected. It is a good book as it is, but some simplification of plot lines and strengthening those that remained would make it a better one. For a full review, please read my piece in the SheKnows Book Lounge. Source: Publisher, for SheKnows.com review. It sounds like a book full of promise that (I am sure) a lot of mothers could relate to. I often feel like sometimes I have lost sight in who I am. I love the cover, too! Disappointing to hear that the author was trying to add too many subplots to the story. That can be a headache.